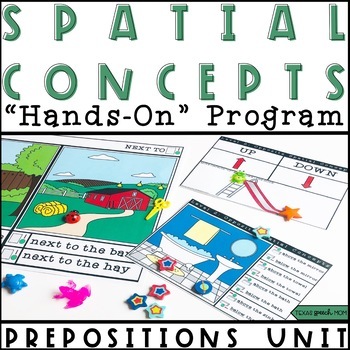 This research based “hands on” program has been created to provide a structured layout for teaching spatial concepts and prepositional phrases. Ready to print and go for immediate intervention! This has been created for speech language pathologists, special education teachers, early childhood teachers, and parents! **DOWNLOAD THE PREVIEW FOR A BETTER LOOK AT WHAT IS INCLUDED! Included: 3 levels of instruction hierarchy, 12 spatial concepts addressed, 52 picture scenes in color and b/w for hands on opportunities to manipulate mini erasers, mini objects, etc. 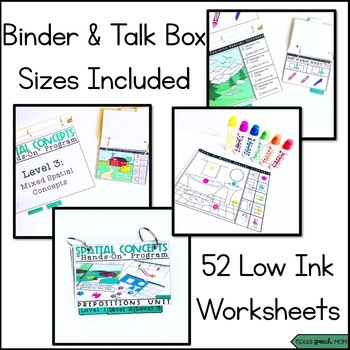 There are also instructions for 3 different printing sizes. Talk Box size is included in separate file. *This resource is a zip file. Let the child pick out their favorite (small) toy. Use your holiday mini erasers. Address fine motor with some pom poms. Have fun squishing small balls of play doh. 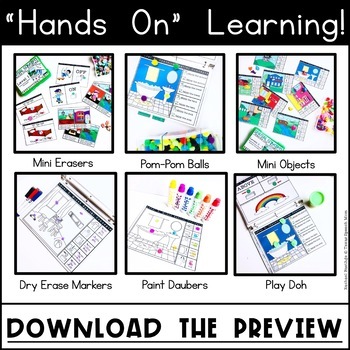 This resource allows the child to LEARN new concepts through “HANDS ON” intervention! 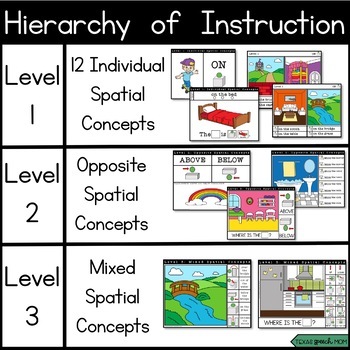 Individual Spatial Concepts: When introducing a new concept to a child, it is important to start with each concept individually. The following concepts are presented separately: up, down, in, out, on, off, above, below, over, under, next to, between. Each concept includes: teaching poster, phrase/sentence visual, 4 picture scenes. Mixed Spatial Concepts: Once the child has demonstrated the ability to follow directions and verbally describe opposite spatial concepts, introduce the mixed concepts. There are 8 scenes with 5 mixed concepts prompts. To address expressive language: use the open ended visual scenes. Place an object on the picture and have the child tell you where it is. Note: Mini objects can be ordered through Dinky DooDads, amazon, or found at local craft stores! Mini erasers can be ordered on amazon, Target dollar spot and party section, and various stores! CLICK HERE TO FIND OTHER INTERACTIVE/RESEARCH BASED "HANDS ON PROGRAMS"!